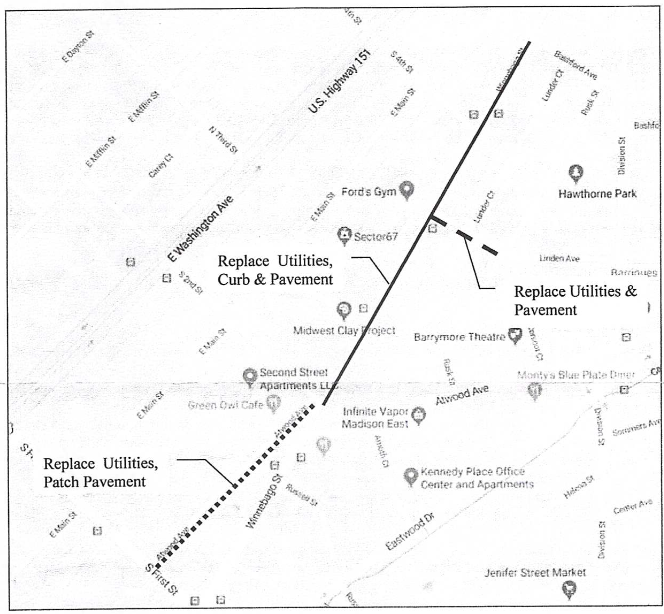 On Wednesday, January 10th at 6:00pm, staff from the City of Madison Engineering department will host a public informational meeting on the proposed reconstruction of Winnebago Street from Second Street to Bashford Avenue. At the time of writing, there is no information available for this project on Engineering’s projects webpage. Instead, notice of the public meeting seems to be limited to a letter sent to adjacent residents and shared via Alder Rummel’s blog/weekly update. Narrowing the travel lanes by 1 ft. each, making the total street width 46 ft., while maintaining all of the existing lanes. Terraces would widen by approximately 1 ft. on each side. Remove parking on one side, but maintain all travel and bike lanes. This option could narrow the street to 40 ft., which would widen the terraces further and improve the grade challenges more. Can also consider an option that combines both of the first options: a portion of the street with all existing lanes, and another portion that has parking removed on one side. Option #1 reflects a slight change from the proposal that was originally presented to the Ped/Bike/MV Commission in November. 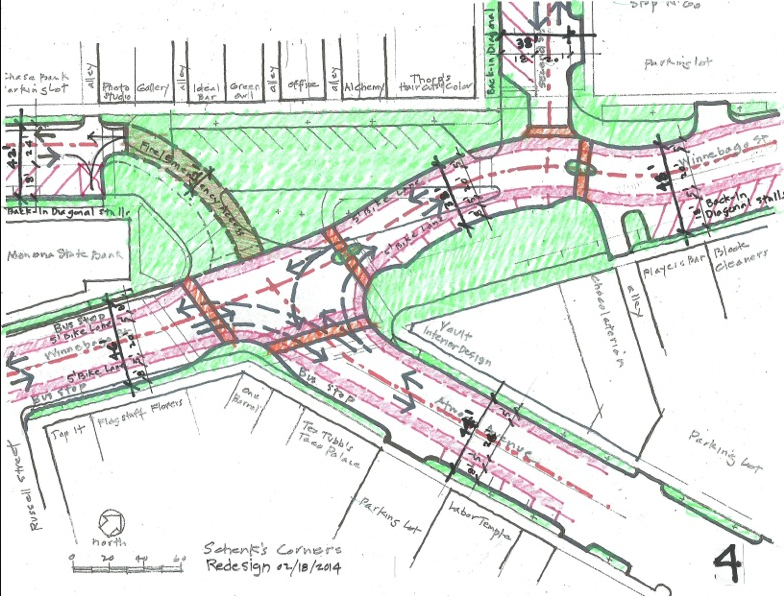 At that meeting, project engineer Jim Wolfe described a concept that would reduce the street width from 48’ to 44’ by reducing the unrestricted travel lanes by 1’ each and by reducing the recently painted bike lanes by 1’ in both directions. This would accommodate a widening of the terraces from three to five foot on both sides. In addition to the grade challenges that result in the need for a railing on the southeastern sidewalk and that prevent comfortable access for people in wheelchairs, the current 3’ terraces do not accommodate tree plantings. 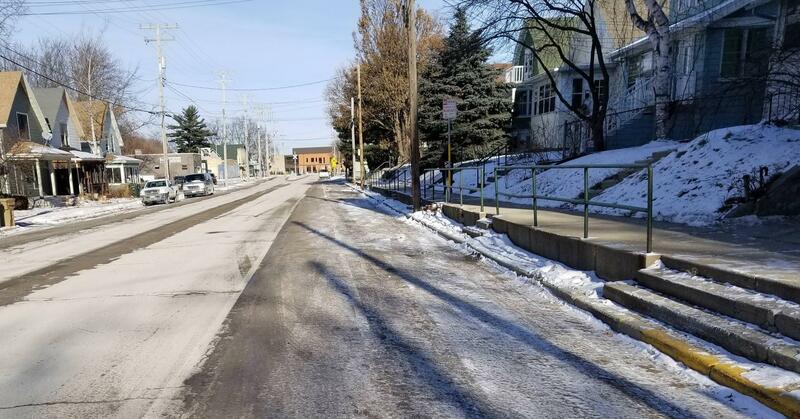 Additionally, nearby neighbors have voiced concern over the difficult pedestrian crossing of Winnebago at Fourth Street (an important walking route for many students to East High School). The southwestern end of this project at Second Street also abuts the long-discussed Schenks Corners area. This was one area of focus for the SASY Committee that was organized around improving the Winnebago-Atwood corridor. That work was put on hold when many of the corresponding street reconstruction projects were pushed out, but there was significant public engagement at that time to identify a future vision of this corridor that improved conditions for people outside of cars. At the heart of this project is the question of space. There’s no suggestion of increasing the public right of way, so any increase of space allocation on the one hand will require a decrease in space allocation on the other. Space for people walking and rolling (sidewalk)- 5’ is the standard outside of downtown. Terrace space - 4’ is required to plant ornamental trees, 5’ for shade trees. This space also accommodates streetlights and signs and street furniture and is where we store snow that’s removed from the roadway and from sidewalks. It also creates a horizontal buffer between cars and people on the sidewalk. Space for biking - With over 4000 cars per day, bike and car traffic needs separation. 5’ is the standard width for a bike lane. Space for parking cars - Parking lanes are generally 7-8’ wide, not including the ‘door zone’. Space for moving cars and buses - The current unrestricted travel lanes are 11’ wide. Reducing the travel lanes to 10’ wide in a section like this has some positive influence on lowering motor vehicle speeds. For larger vehicles like trucks and buses, 10’ can be a little narrow and requires careful consideration of the immediately adjacent space. 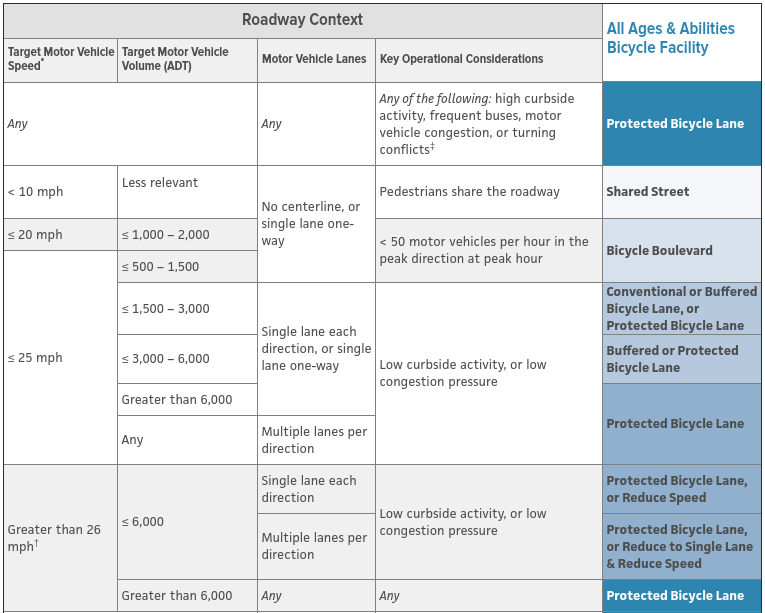 The images above are from NACTO’s Transit Street Design Guide. They show the typical dimensions of different vehicles and the area required to safely operate those vehicles. Buses, for example, are typically 8.5’ wide--10.5’ wide including the side mirrors. (Metro routes 4 and 10 run on this stretch of Winnebago.) The width needed to safely operate a bus in normal conditions is listed as 11.5’. In general terms, this means that a bus operating in a 10’ wide lane requires another 1.5’ of clear space. In these diagrams, the “minimum” distances cited are based on legal standards that do not provide for good performance in real world situations. The “desired minimum”, on the other hand, provides a good starting point for street design. You can see that the desired minimum for a bus adjacent to a person on a bike is 17’. Another way of understanding this is: a 10’ unrestricted travel lane plus a 2’ buffer plus a 5’ bike lane. Similarly, the recommended minimum of a parking lane and adjacent bike lane is 14’. This can be understood as a 7’ parking lane plus a 2’ buffer plus a 5’ bike lane. This allows for an actual clear zone of 3’ between the parked car and the cyclist, which is critical to prevent crashes in the ‘door zone’. The need for a ‘buffered’ bike lane in this context is also supported by the recently published All Ages and Abilities Bicycle Facility guide. It calls for a buffered or protected lane when motor vehicle volumes exceed 3000/day. 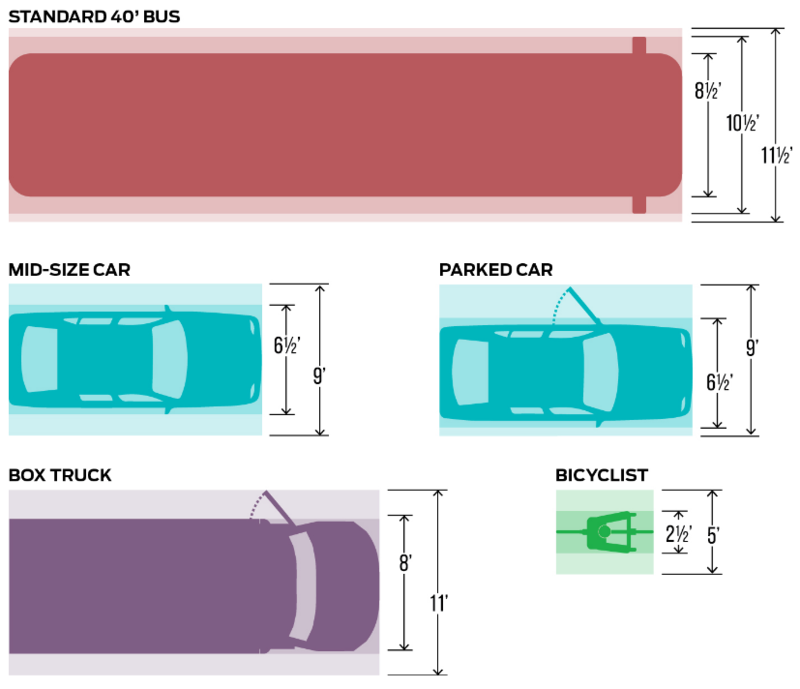 Engineering’s proposed alternative #1 would reduce the space available for parking, biking, and driving to 23’ on each side. That’s 3’ less than the recommended 26’ described above. It’s not hard to understand that those 3’ come out of the needed buffer between people on bikes and parked cars on the one side, and people on bikes and motor vehicles on the other. It effectively shrinks the safe, usable portion of the bike lane to 2’ wide. 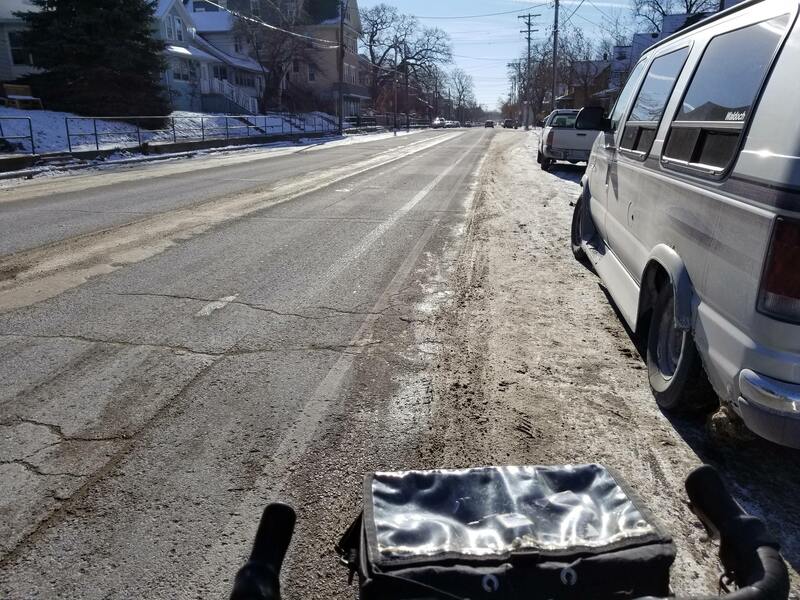 It also doesn’t take into account the effective shrinking of available road space that happens as a result of snow and ice accumulations over the course of the winter in Wisconsin. As snow and ice build up, cars are parked further towards the center of the roadway and often into the bike lane itself. 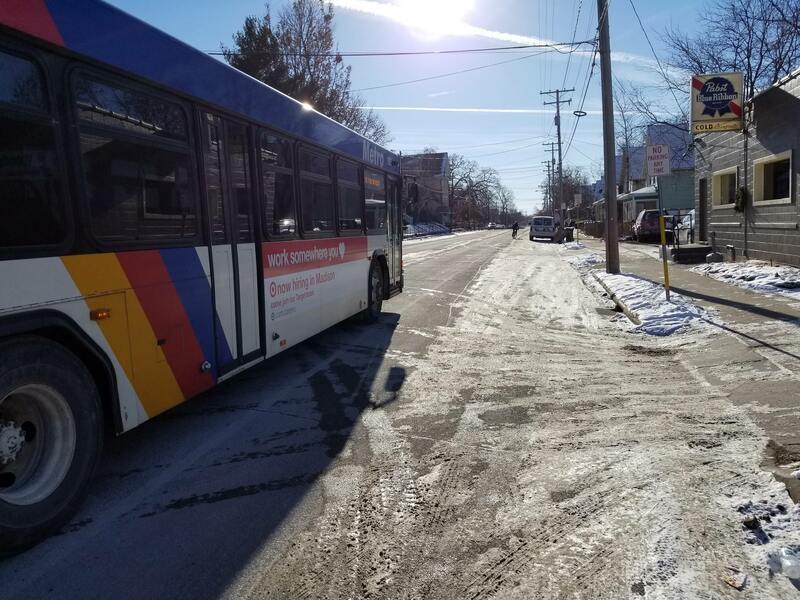 Snow and ice removal in the unbuffered bike lane is also problematic as city plows can’t get close enough to parked cars without risking damage to side mirrors. This leaves the unbuffered bike lane in poor conditions and often completely unusable. Providing a 2’ buffer along the parked cars largely resolves this issue. Considering all of the above, we have a great opportunity to significantly improve this important public right of way. We can: 1) widen the street terraces to allow for street trees and improved comfort for people walking, 2) eliminate the need for the guardrail on the southeastern sidewalk and provide comfortable access for people in wheelchairs, and 3) provide safe and comfortable conditions for people of all ages and abilities to move through the corridor by bike. The cost of those improvements is a reduction in the available on-street car parking. While it’s likely that this tradeoff could provoke a strong reaction from some neighbors that benefit from the convenience of the existing, free on-street parking, there’s a compelling case that it’s a worthwhile tradeoff that would provide significant community benefit and that is most consistent with the goals outlined in our city's recently approved Sustainable Master Transportation Plan.